Happy Birthday, Dad! 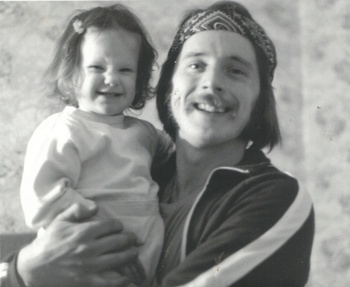 I'm pretty sure that he doesn't read my blog, so I'm safe posting this ridiculous picture of him (holding me), circa 1978. Very funny. And here's his birthday gift, made this weekend (thank you, thank you Steve for all the sewing time! more results of that crafting time coming tomorrow!). In the center is Calvin's art, scanned and printed onto fabric (using the Bubble Jet stuff). I've done this before with only minor success, but I think a key point is using really GOOD quality, high thread count white fabric to print on (a great tip from Gerrie - Happy Birthday to her too!). 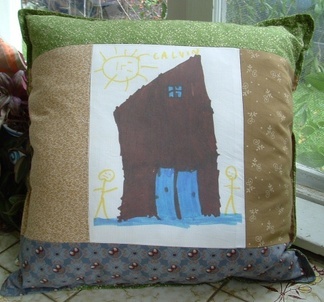 The drawing is of my parents' new log cabin, which they've built, and this pillow is made to match the wall quilt I made for them this spring. I think I'll be doing some similar pillows and things for family holiday presents with more of the kids art.